For the uninitiated: Gault et Millau incarnated first in 1965 as a collaboration between restaurant critics, Henri Gault and Christian Millau in in 1965. Tonight’s launch of the latest Australian edition saw chefs, sommeliers, industry folk and friends convene for the exclusive launch of the Gault & Millau Restaurant Guide 2018 and to celebrate the global influences that make up modern Aussie Cuisine, toast the year that was, and raise a glass to the best restaurants and chefs across Australia – a market Gault & Millau expanded its reach to in 2014. Following the standards set by the original French guide, the 2018 Restaurant Guide focuses on what really matters: the food. Gault&Millau acknowledges the skill and creativity of chefs and the quality of the food above all other aspects of restaurant dining with its independent judges providing the reliable, unbiased reviewing that remains the cornerstone of the guide. The universal scoring system allows restaurants in the guide to measure themselves against their peers around the world. 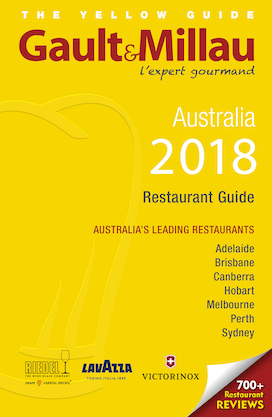 Being the only internationally recognized restaurant guide on terra australis and with over 700 restaurant reviews across Sydney, Melbourne, Brisbane, Canberra, Adelaide and Perth, the 2018 Restaurant Guide is designed for savvy diners and the ideal compass to navigate Australia’s vibrant restaurant scene. Ben Shewry's Attica received Restaurant of the Year following being awarded five hats. The prestigious Chef of the Year was awarded to Shaun Quade of South Melbourne’s Lûmé. Chris Lucas' Kisumé secured New Restaurant of the Year. French-born pastry chef, Pierrick Boyer (Le Petit Gâteau, Melbourne) received Pastry Chef of the Year. John Rivera (Amaru, Melbourne) was named one to watch as Young Talent of the Year. Sommelier of the Year went to Carlos Simoes Santos of Vue de Monde (Melbourne). Clare Wallace secured Professional of the Year as owner and manager of Brisbane brasserie, Montrache. Pepe Saya (NSW) won Producer of the Year for their cultured butter.